Just a quick update to show I am actually getting somewhere. 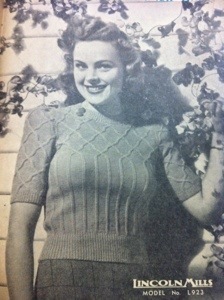 My vintage jumper knitting project is looking a little bigger now. 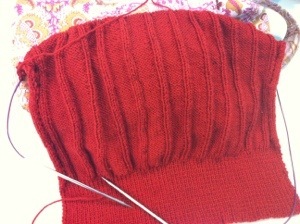 I am just about ready for armhole shaping, but I think I have a cable cross to come first. The indoors garden is only going half as well as I had hoped. Only the mustard is sprouting. This is understandable as the seeds were all very old. But I had hoped that maybe two out of four would take. Oh well, at least I know now. I’m having a relaxed day today, it is lovely. 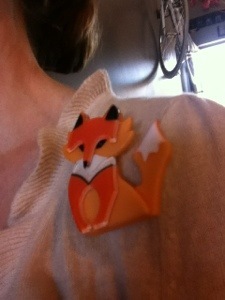 I’ve slept in, flooffed away the last of my morning, popped on my new Erstwilder brooch, then set out to trawl a local op shop. It just seemed a good start to a fairly aimless day. I came away with some interesting vinyl records and a cute pinstripe pencil skirt, so yeah, good. 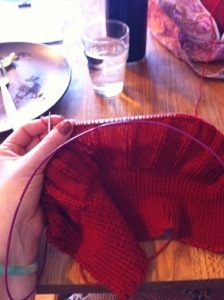 Now I’m getting in a few rows of knitting while I test out a new local bakery cafe. I have been meaning to get to Lift for some time and I’m not disappointed now that I’m here. 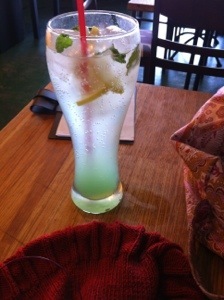 The staff are lovely and everything looks tasty and exciting. 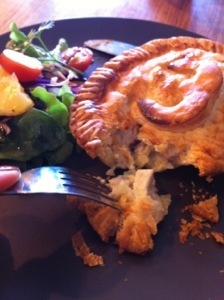 I’ve just polished off a homemade chicken and leek pie with salad. I’m not usually a side salad fan, but this one I liked, I actually ate it all! The pie was impressive, I don’t ordinarily go in for those either, but it helps when the person recommending it to you is the one who made it (and is proud of their work). It was especially flaky on top and good and chunky inside. What’s not to love? So now I’m knitting away, sipping on an in-house soda, pine mint, and contemplating finding room for a homemade eclair and a cold drip coffee. Perhaps to take away, that doesn’t sound do bad, right? 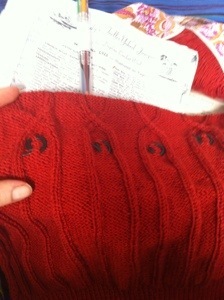 Looks like there may be call for a small tea party or crafternoon tea around here in the near future. 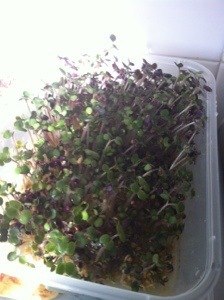 I have, rather randomly, decided to do a bit of sprouting again. It’s been at least 2 years since I did it last. That’s a long time between cress cream cheese cucumber finger sandwiches! 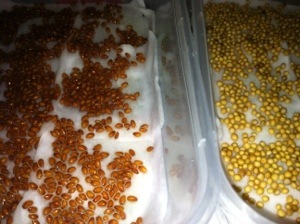 That is cress on the left and mustard on the right, another classy sandwich favorite. I have some spring onion and baby spinach going too. I haven’t sprouted those before. I’m unsure yet if I’ll cut them young for use in salads and sangas, or if I’ll turn them over to my housemate Miss Betsy for replanting in her slightly more legitimate garden.